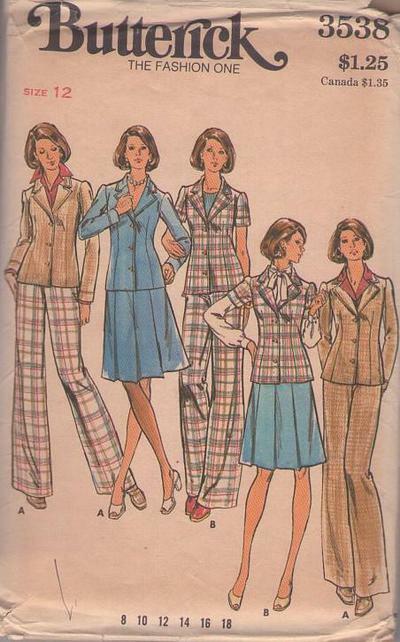 70s Separates, Retro Office Clothing Patterns - MISSES' JACKET, SKIRT & PANTS. Semi-fitted, unlined jacket has front- buttoned closing, notched collar, short or full length sleeves, and topstitch trim. (Jacket made to be worn over lightweight tops). A-line mid-knee length skirt has one-way front and back pleats stitched to hipline, waistband, and side zipper closing. Straight-legged pants darted into waistband have side zipper closing. Purchased blouses and tops. CONDITION: This Original Vintage Sewing Pattern was part cut & used. All pieces appear to be complete and intact and have been neatly refolded with the original instructions.